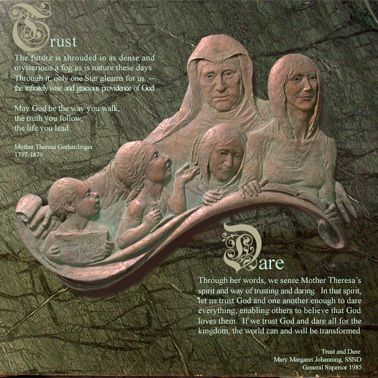 Mother Teresa for Notre Dame College 2004, Bronze, 5' x 5' panel, commissioned. This relief sculpture portrays a German sister, Mother Teresa, as the founder of hundreds of girl’s and women’s schools worldwide, including Notre Dame in Baltimore, MD. The concept shows the protective care of the sister through a child’s progression into adulthood.